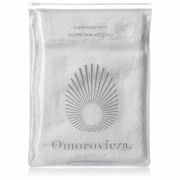 Omorovicza Magical Moments is a high-performance duo powered by the healing, mineral-rich waters of Hungary. Housed in a gift box, the skincare kit helps you to achieve a complexion that appears firm, smooth and youthful. An ultra-fine, two-phase formula enriched with antioxidants and nourishing essential oils. Infused with Rosehip, Avocado and Macadamia Nut Oils, the luxurious mist delivers optimum levels of moisture and hydration, whilst defending against pollution and environmental aggressors for long-lasting comfort. Ideal for using throughout the day to rejuvenate tired skin and replenish moisture, you can expect a plumped, revitalised complexion without greasy residue. The brand's patented Healing Concentrate™ mineral delivery system promotes firmer, more supple and younger-looking skin. A weightless, delicately scented formula that delivers multiple benefits to skin. Enriched with Apple Pectin and a nourishing blend of Rose, Sage and Orange Blossom Waters, the refreshing mist balances and hydrates, whilst the brand's patented Healing Concentrate™ infuses minerals deep into skin to promote a firmer visage. Inspired by the Queen of Hungary Water - the world’s first recorded perfume specially formulated for Queen Elisabeth of Hungary in the 14th Century - the non-greasy spray can be used as a purifying post-cleanse toner, or as a revitalising spritz throughout the day to soften and replenish.